Broadway producer satirizes an important New York family. The family sues but their daughter falls in love with producer. 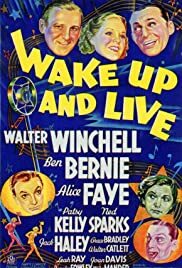 Q: Why is NO video version available of WAKE UP AND LIVE, one of the great 1930's musicals? One of Darryl F. Zanuck's peculiar quirks was that he frowned upon his musical stars making records. Unlike Bing Crosby who recorded nearly all the songs he sang in Paramount films and numbers from other Paramount films with the encouragement of Adolph Zukor, Zanuck felt that if the public bought records they wouldn't pay to see his films. Alice Faye did manage to record about 20 sides during the Thirties and the last batch she did was four songs from Wake Up And Live. Good thing to because Mack Gordon and Harry Revel wrote some of their best material for this film. The film itself was based on a make believe radio feud between columnist Walter Winchell and band-leader Ben Bernie who play themselves on screen. Make believe feuds among radio personalities was a common enough thing back in the day, it made for interesting programming and bigger Hooper ratings. The Hooper was the radio equivalent of the Nielsen before television became commercial. Jack Haley and Grace Bradley are a pair of vaudevillians who travel to New York hoping to cash in on the fact that Haley's sister Patsy Kelly is Walter Winchell's assistant. A mention in Winchell's column gets them inundated with offers, but Haley who apparently has no problem performing before a live audience of a hundred or so in a theater, gets paralyzed with fear over speaking and singing into a microphone that will broadcast to millions. But one night when Alice Faye is singing on Ben Bernie's program, Haley is in an empty studio singing into what he thinks is a dead mike. 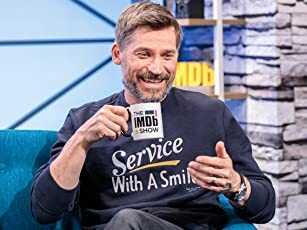 His voice comes over the air and no one knows who it is. Immediately he's dubbed 'The Phantom Troubadour' and the hunt is on to find him. It's a contest between Winchell, Bernie, and a bottom feeding sleaze-bag agent played by Walter Catlett. Of course Faye finds out first and looks to exploit Haley in her own way. It's a nonsensical plot, from an era that spawned this kind of nonsense. Doesn't detract a whit from the fact it's an entertaining film with Alice Faye singing at her very best. But you won't hear the familiar voice of Jack Haley that you know as the Tinman from The Wizard of Oz. Instead Haley's voice in this film is dubbed by one of the great radio crooners of the time, Buddy Clark. Buddy never did too much work before the camera, but on radio he was one of the most popular singers in his era. Sadly he was killed in a plane crash right before the era of television, I'm sure he would have made it big there. Alice and Buddy get to sing the title song, Never In A Million Years and Swell Of You. Alice does There's A Lull In My Life and Buddy sings Ooh, But I'm Happy. Long before I finally got to see Wake Up And Live I had a long playing 33 1/3 vinyl album of Alice Faye with the four songs she sings before Zanuck put an end to her recording career. I knew the songs and loved them. So it was a special treat for me to finally see the film and more so to hear Buddy Clark sing as well even if the words came out of Jack Haley's mouth. I think if you can ever catch Wake Up And Live you will feel as I do about the great singing voice of Buddy Clark.